This year I attended my third MozFest – my first as a Mozilla Foundation employee. Working as a pathway leader in the Mozilla Learning Networks (MLN) space helped me focus on helping others. In years past, I hosted conversations and hacked on a giant scrum board. I steered my own magic carpet-ride of learning. However, this year I organized supplies, supported facilitators and promoted their sessions, and talked curriculum with anyone who’d listen. This all felt like the right job at the right time. During set up, between sessions, and at the end of it all, I was never so happy to move tables and chairs as I was at Ravensbourne. I think Mozilla is especially good at engineering this kind of serendipity between what you’re ready to give and what needs to be done whether you call communities to action, push furniture, or ship code (not that those things are mutually exclusive). 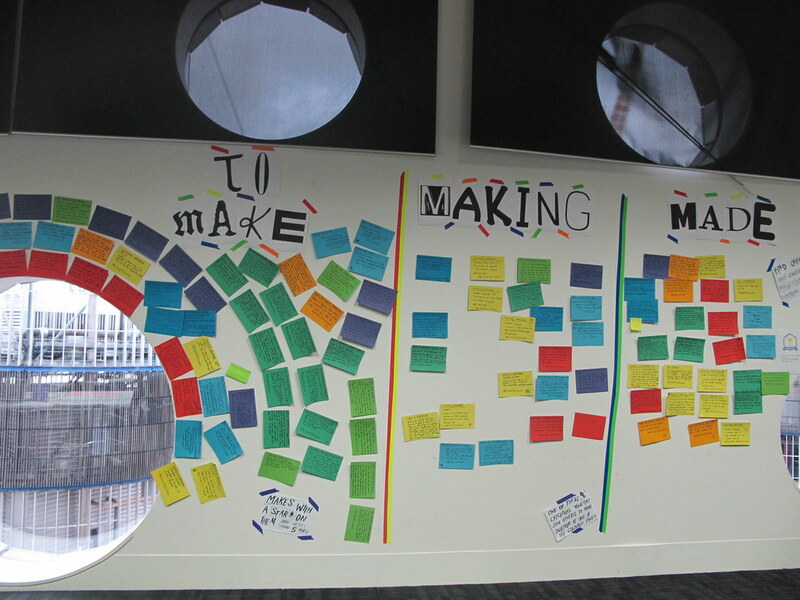 Hera Hussain explains it best in this post about her journey to MozFest 2015. Building interactive explainers for Web literacy. Designing curriculum with Open Web tools like Scratch. Improving Thimble for classroom use. Localizing curriculum into languages like Songhay. Sharing curriculum development practices between MLN and the Mozilla Developer Network (MDN). Using teaching and learning from games to inform curriculum design. I left inspired by the sessions and work that happened all over the festival. I am proud of my colleagues’ work to organize MozFest and thankful for the participation of every facilitator, partner organization, and attendee. A community ‘call’ inspired by Ricardo Vasquez’s YouTube series, ‘The Hour of Design’, that invites allies and partners to prototype thematically-linked activities that teach with the Web. Curriculum that includes more webby media and that really takes advantage of the web’s storytelling affordances to immerse learners in our materials. Game-like data frameworks designed for learners that help users self-assess and goal-set as they would in a MOBA or RPG. Improved processes and supports for curriculum testing and localization. Printer-friendly stylesheets that complement emergent curriculum templates so that materials can easily make their way offline when people need them to be lo-fi or no-fi. Those are the big pictures I want to help achieve by working alongside wonderful colleagues and community members leading the way to an open web. MozFest gives us an opportunity each year to say thank you for believing in us; we believe in you. It’s also our opportunity to reaffirm our belief in community. Behind, within, and surrounding the Open Web is a world of people who deserve nothing less. Helping those people shape the Web is a privilege, and I’m thankful for it. PS – We are all local to MozFest! If you’d like to help keep the MozFest spirit going, you can help us test and localize curriculum year-round. Please let us know if you have questions or work to share!